So sorry for such a delay. Here is the new nail art. A nail art so simple and fun to do. Lets quickly have a look on the steps!! 3. Apply 2 layers of white nail paint. Note: Two layers are must because one layer will not be as thick and clean as we net it to be. White nail paint is the perfect colour for your coloured nail paints to have more effect. 5. Choose your favourite colours and make horizontal strokes of each colour one by one as you can see in the picture. Note: You can either use a toothpick or a nail art rush for this. 7. After the nail art is done, let it dry and put a thick layer of the same transparent nail paint on ur nails to safeguard your art. 9. Your nails are beautiful than ever! I hope that you liked this nail art. It is simple to do yet looks so beautiful and colourful. 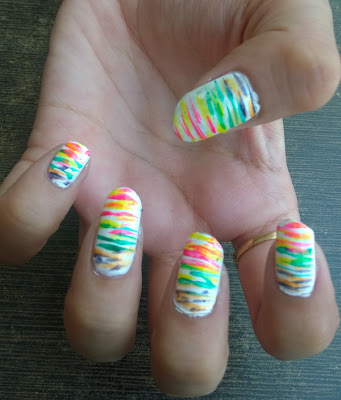 For more such nail arts, stay tuned. Please comment your suggestions and views. They are well appreciated.